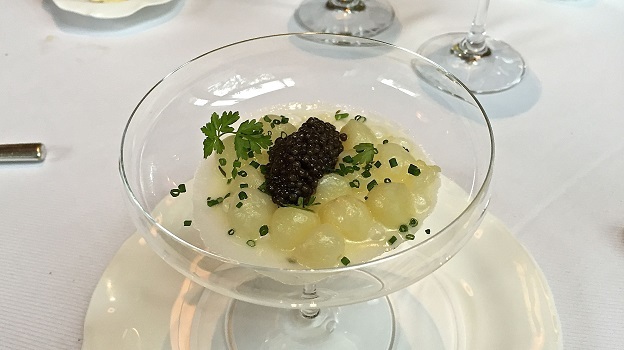 Jean-Georges remains one of my favorite spots in New York City, especially at lunch, where the menu is one of the best deals in town for this lofty level of food, wine and overall experience. Although I did not see him on this visit, Chef/Proprietor Jean-Georges Vongerichten is often in the room, but even when he is not around, his brother Philippe is a steady, calm presence on the floor. The hustle and bustle of the city comes to a complete halt once inside the open, airy dining room. Light colors and large windows add to an overall impression of calmness. A glass of Pascal Agrapart’s 2007 Experience is a great way to settle in and start perusing the menu. Experience is of course Agrapart’s newest creation, bottled with the addition of fresh 2008 must rather than sugar to induce the secondary fermentation. On this day, the Experience is decidedly vinous in texture, yet light on its feet and absolutely sublime. Rather than try do whittle the menu down to a few dishes, we simply opt for the tasting menu, which turns out to be a great choice. 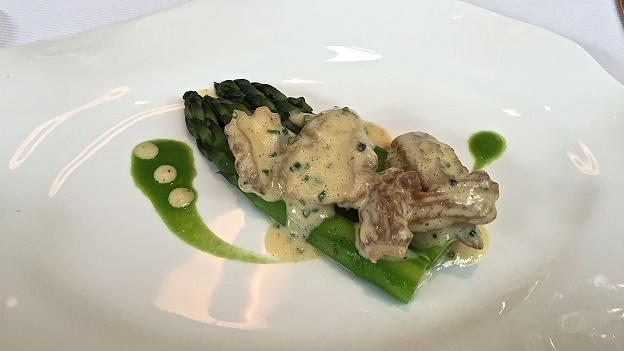 The Warm Glazed Potatoes with Caviar presents a striking combination of textures and temperatures, while the Green Asparagus with Morels screams of spring. Both are superb. 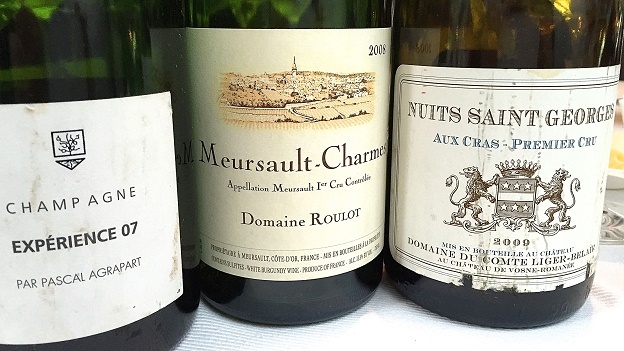 Jean-Marc Roulot’s 2008 Meursault Charmes is striking, but also a bit richer and more honeyed than I remembered it. Probably a leaner, crisper white would have been better for the early courses. That is splitting hairs, though, as the Charmes is terrific, with notable breath and richness throughout. The Slowly Cooked Hake, with its Spring Lettuce Purée, Herbal-Lime Vinaigrette is a classic Jean-Georges dish with bright flavors, salivating acidity and invigorating freshness. Liger-Belair’s 2009 Nuits St.-Georges Aux Cras is radiant, open-knit and impeccably polished, with tons of vintage 2009 sunshine and ripeness coming through. Today, the new oak is still prominent while the wine itself remains quite young, so readers who are able to should continue to hold the 2009 for at least a few more years. At this stage, the Cras has still not fully come together. Aged Bordeaux and lamb is one of my favorites wine and food pairings. 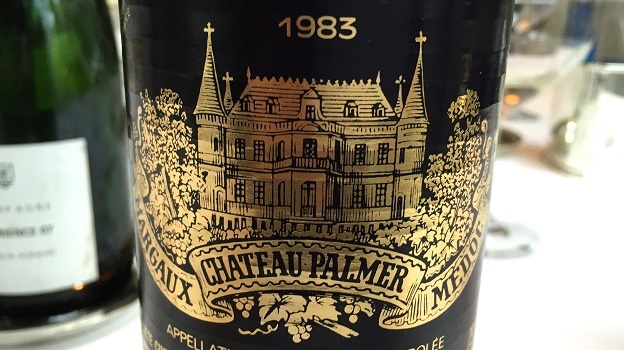 The 1983 Château Palmer is simply divine, with plenty of intense dark fruit, cedar, tobacco and spice. From time to time, slightly more angular contours start to show, which is not a big deal at the table, but it may be that the 1983, while still quite striking, is peaking and getting close to turning into the home stretch of its maturity. 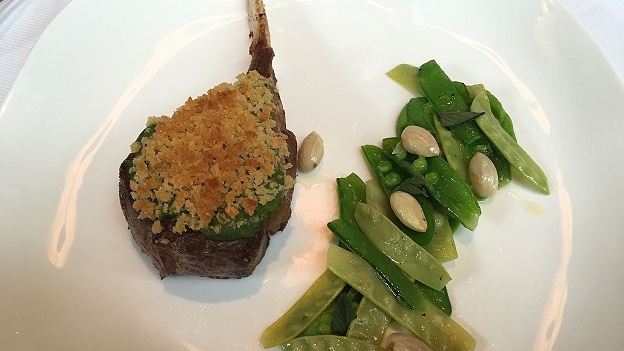 It is sublime with the Roasted Rack of Lamb, though, and a real treat to taste. A rare disappointment at Jean-Georges, the Foie Gras Terrine is the only dish in this tasting menu I don’t care for. The granola and balsamic are distractingly sweet as the lines are blurred between savory and dessert courses. I imagine some readers might appreciate this interpretation more than I do, but in my view, the foie gras is overly sweet and also not an especially good pairing with mature Bordeaux. 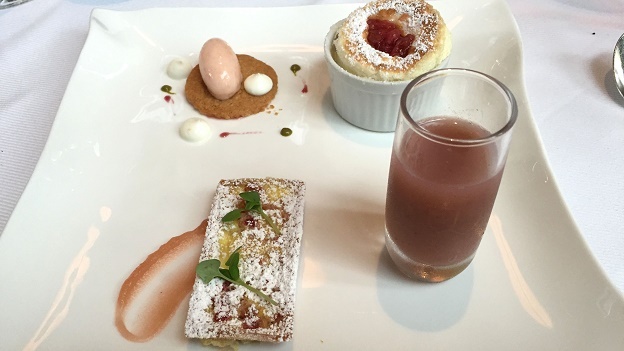 The Rhubarb Dessert Tasting puts things back on track with four playful versions on a theme. Although I am not a huge dessert fan, I do believe that in many ways the last course in a tasting menu is the most important. A disappointing dessert can ruin an entire meal, while a delicious dessert can be uplifting. The latter was certainly true on this day. The prix-fixe lunch menu is $48 for two courses ($24 for each additional course), while the tasting menu is priced at $158 per person. Dinner prices are $128 per person for three courses or $208 for the tasting menu. The wine list is extensive, with a strong selection of older vintages, especially in Bordeaux. Prices are high, though, so readers are best served by look at lesser-known regions for the better values. Planning in advance is essential, as tables fill up quickly, but readers who have a chance should not miss an opportunity to visit Jean-Georges.